Uponor, Inc. is an award-winning provider of plumbing, fire safety, radiant heating/cooling and hydronic distribution piping systems for residential and commercial applications. In 2014, the company received the Community Impact Award for Sustainability and the Progress Minnesota award for driving business growth and economic development. In 2013, the company was named Manufacturer of the Year by the Manufacturers Alliance and a Top 100 Workplace by the Minneapolis Star Tribune. 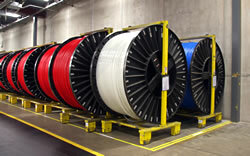 Uponor, Inc. employs nearly 500 people at its North American headquarters in Apple Valley, Minn. For more information, visit the Uponor media room at http://uponor.greenhousedigitalpr.com/archive/ or www.uponor-usa.com or call (800) 321-4739. Uponor makes crosslinked polyethylene (PEX) tubing for plumbing, fire safety and radiant heating and cooling systems. The North American manufacturing facility and corporate headquarters are located in Apple Valley, Minn.